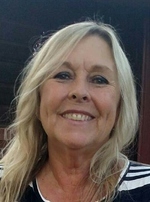 Kathryn Verline Tucker-Thayer, 58, of Bayfield, CO died August 2, 2018. Born November 20, 1959 in Grand Junction, CO., "Kathy" spent her early years in Western Colorado. At the age of 8, she moved to California with her family, where she attended grade school through high school. Her absolute joy in life were her 14 grandchildren. She always had a smile on her face but never as big as when the grandkids were with her and the center of her attention. She had a passion for motorcycle riding, including, encouraging, and training others, especially female riders. Kathy performed with the Hardley Angels drill team and also was a motorcycle safety instructor. She worked as a merchandise manager at the Durango Harley Davidson, where she met her husband, Daniel Thayer. They were married on March 29, 2014. Kathy was active in the LDS Church, including teaching early morning religious classes before school. Her love of the Lord and compassion for all was an amazing example of living a Christian life and serving others. Her bright light will be missed dearly by all. Kathy is survived by her husband, Daniel; parents, Dave and Janice Tucker; brothers, Stephen and David Lloyd Tucker; children, Amy Varney, Daniel Moffett, Sam Moffett and Wendy Robinette, as well as numerous extended family and friends. There will be a public viewing on Thursday, August 9, 2018 from 4:00-7:00pm at Hood Mortuary Chapel, 1261 E. 3rd Ave., Durango, CO. Funeral services will be held on Friday, August 10, 2018 at 10:00am at the LDS Church, #2 Hilltop Circle, Durango. Interment to follow services at the Pine River Cemetery, 405 C.R. 501, Bayfield, CO.